Is OTC Salicylic Acid Safe to Use on My Warts? In looking at over-the-counter wart remedies, you have noticed that they all seem to contain salicylic acid in varying degrees of strength. You aren’t quite sure you want to apply an acid to your skin. None of the products indicate whether salicylic acid for warts leaves a scar. You don’t want to replace an ugly wart with an ugly scar. How can you know which strength is best for the size of your warts? Creams, lotions, and liquids all contain salicylic acid. Which one should you purchase? Keep reading this article has the answers to your questions. Does It Work on Plantar Warts? Almost all warts have a rough surface. Some warts, especially those located on your feet, are covered by a callus. A callus prevents any medication from reaching the wart itself. The surface of the wart also prevents the penetration of many treatments. Killing a wart usually requires removing any dead skin and the surface tissue so that the medication can penetrate to the inside of the wart. 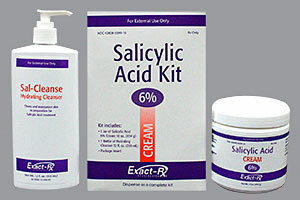 Salicylic acid treatment for warts is an effective external remedy. It is classified as a keratolytic medication. Keratolytic products are weak acids that will slough away or exfoliate outer layers of skin, including the tough outer layers of warts. 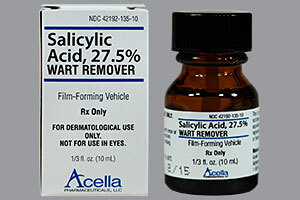 Repeated applications of salicylic acid will eventually shrink the tissue of the wart until it’s gone. It will take two weeks or more to shrink most warts. The skin near the wart may redden and you may feel some tenderness in the area. That’s your immune system responding to treatment. Warts are caused by a virus and only your immune system can kill the virus. 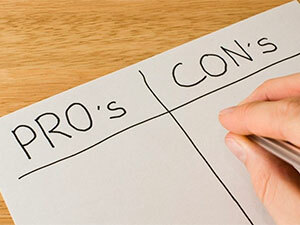 Regardless of what remedy you choose, warts can recur until the virus is suppressed. You will find information here on a freeze wart procedure. Before using any remedy on your warts, including salicylic acid, you need to make sure it is a wart and not a mole or other lesion. Wart treatments used on other skin problems can potentially make them worse. If there is any doubt in your mind, you definitely need to consult a skin specialist, such as a board-certified dermatologist. If it’s a wart, you can then decide whether to treat it at home. Treating warts with salicylic acid requires more than just applying the product. Begin by softening the tough outer part of the wart. If you have plantar warts, it’s easy to soak your feet in a pan of warm water for a few minutes. 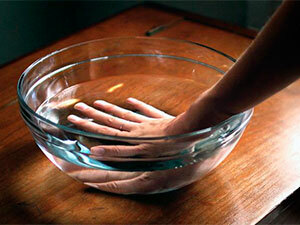 You can also soak your hands easily. If your warts are in areas that you can’t immerse in water, try holding a warm cloth over them. When you have softened the wart as much as you can, your next step is debridement. Debriding means removing as much of the outer tissue as you can. 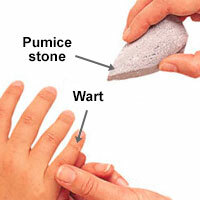 Use a pumice stone or emery board to file off the callus and the top part of the wart. 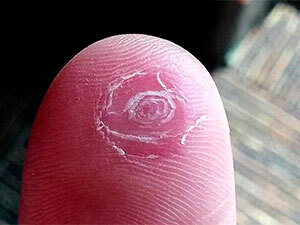 You want to do this gently to avoid irritating the wart or making it bleed. If you are very careful, you may use tweezers to pull away any dead skin. Do not let other members of your household use any object that you use on your wart. Avoid letting anything that touched your wart come into contact with other parts of your body. 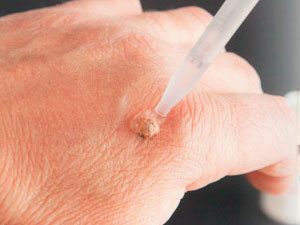 Warts are extremely contagious and easily spread by touch. After you’ve debrided your wart, it’s time to apply the salicylic acid. Topical means that the treatment is applied to the skin. The instructions for creams, lotions, and ointments are very similar. Make sure your wart and the surrounding skin is completely dry. Apply a thin layer of your chosen product to the top of the wart. Avoid getting salicylic acid on healthy skin. Unless your specific instructions say otherwise, cover the wart with a bandage. Leave covered for 24 hours, then repeat the process of soaking and debriding before applying more salicylic acid. Continue until your wart disappears. 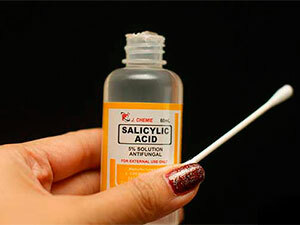 Gel and liquid solutions of salicylic treatment for warts follow much the same procedure as other products. You apply the salicylic acid to your wart one drop at a time, usually at bedtime. You then cover it with a bandage or plaster overnight. Uncover and wash the salicylic acid off the next morning and debride. Repeat the process each night until your wart is gone. Salicylic pads and plasters are saturated with the acid. As with other products, you must first soften, debride, and dry your wart. The pads are simply rubbed over the wart. Do not wash off the acid. Plasters are stuck on the wart and usually remain in place for two days. Both will exfoliate the top portion of the wart. Over time, with repeated treatment, the wart will shrink into nothing. If you want to use silver nitrate for warts, you will find information here. Warts on your feet, known as plantar warts, can be very painful. Many procedures for wart removal are also painful, and some may require that you stay off your feet. Salicylic acid can be effective for your plantar warts. Because plantar warts are often covered by a callus, soaking and debriding is essential. The treatment may initially make your plantar wart more tender, but as you keep removing the outer parts of it, the wart causes less pain when you walk. Salicylic acid works on plantar warts the same way it does on other warts, that is, it causes the outer layers to slough off. You may find a salicylic plaster the most comfortable because it can also cushion your foot. None of the salicylic acid wart removal products are 100% salicylic acid. They all have one or more other ingredients. You may have to experiment with different brands to find one that is effective in killing your warts without unduly irritating your skin. Read the labels carefully to make sure there are no added ingredients that you are allergic to. The various formulations contain different amounts of salicylic acid. Salicylic creams for warts range from 2% to 60%. The milder ones can be used on children older than two years. You can learn about freeze away wart remover here. Most drugstores also have their store brands, which can be quite economical. Products with high percentages of salicylic acid are available only by prescription. These include the salicylic acid 6% cream kit. The kit includes a special cleanser and a jar of 6% cream. It’s prescribed by dermatologists for a variety of skin treatments, including wart removal. The greater the percent of salicylic acid in any product, the less often you need to apply it. However, using a higher concentration of salicylic acid can excessively irritate your skin. Start with a lower percentage and choose a product with more salicylic acid only if the lesser amounts don’t work for you. If your wart starts to bleed, changes in shape or size, or becomes very painful, then you need to seek medical care. None of these changes are normal for a wart. Your health care professional can evaluate the growth and help you decide on a treatment that’s best for you. As with any treatment for any condition, salicylic acid for wart removal has advantages and disadvantages. 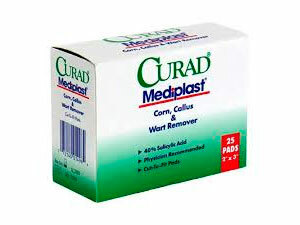 Can be combined with other wart removal treatments. Can be used in privacy of your home. Inexpensive compared to other treatments. Can’t use while taking certain medications. Not recommended for genital warts or warts on sensitive skin. Requires softening and debriding warts. Usually takes a long time to work. You will need to consider the pros and cons as they apply to your particular circumstances before deciding if you want to use salicylic acid for your warts. The fact that salicylic acid is a caustic substance is not something to worry about if you use it according to instructions. Salicylic acid has been recognized by the FDA as a safe and effective treatment for warts. Like all wart remedies, it’s more effective for some individuals than it is for others. As always, you’ll have to experiment with the different formulations to find what works best for you. You’ll need patience, but the wait can be worth it as you watch your warts disappear day by day. You can find further details of OTC warts remover here.